What Makes an Award-Winning Bike Map? Congratulations to our GIS Specialist Kody Thurnau. 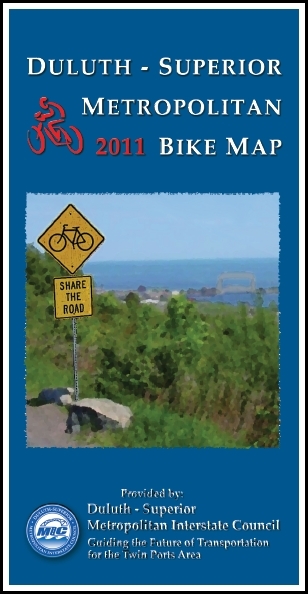 His redesign of our popular Duluth-Superior Metropolitan Bike Map took not one but two awards from juries of his peers at the 2011 Esri International User Conference in San Diego, CA. The map was awarded first prize in the category Best Cartographic Design Single Map Product – Large Format Press Copy. Judged by 38 Esri staff members for general and specific cartographic quality, entries in this category had to be a single map product larger than 11 in. x 17 in. but not exceeding 48 in., printed professionally on a printing press. The map was also one of three overall winners of the Cartography Special Interest Group (Carto SIG) Map Awards, out of 1,200 conference Map Gallery entries. In other words, it’s perfectly designed to for people who want to bike in, around or between Duluth and Superior, whether you’re a recreational rider or an urban commuter. You can pick up own copy of the Duluth-Superior Metropolitan Bike Map at local bike shops, tourist information outlets or email us at dsmic01@gmail.com and we’ll mail you a copy. Right now we have a pdf version of the map available for you to download on our website. Never fear, Kody is hard at work converting the print version into an interactive map you’ll be able to access and use online.